Keeping your beard looking, feeling and smelling great takes commitment. You can’t expect to just grow it out and let it fend for itself. If you want a beard that makes the right impression you’re going to have to familiarize yourself with some basic beard grooming tools. And nothing is more fundamental to beard care than the right beard shampoo. 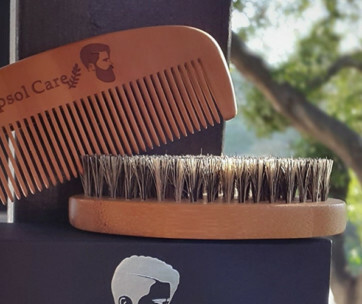 Beard shampoos are specially formulated to contend with the specific characteristics of facial hair as well as the skin on your face and neck, so no beard grooming kit should be without it. 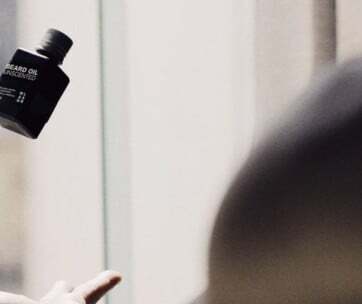 Below are the 6 best beard shampoos for 2019. 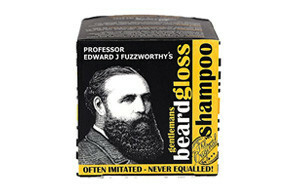 Professor Fuzzworthy’s Beard Shampoo might as well be called Professor Buzzworthy’s because it’s the closest thing you’ll find to a given on any list of best beard shampoos. Fuzzworthy has done his homework and formulated a beard shampoo that’s easy to use and produces a beard you’ll be proud to wear. Natural and organic ingredients are the order of the day here including castor oil and olive oil as well as Kunzea oil from Tasmania and lavender. It might take you a few minutes to find your rhythm when it comes to producing a full lather from the cube but once you get the hang of it you’ll be sold. The Professor leaves you feeling fresh and clean and your beard light and airy, no matter how coarse your facial hair. Your beard will have presence and so will you. For those concerned that the shampoo bar might not last very long keep in mind that it’s the equivalent of nearly 30 fluid oz or 2 standard shampoo bottles. 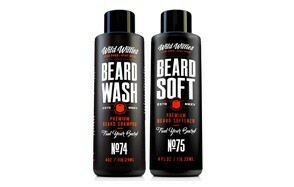 In spite of the fact that the name and artwork here embrace the great beyond this is a beard shampoo that wants you to look good in the here and now. 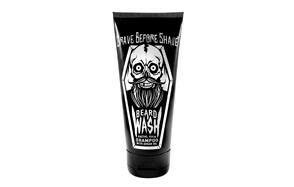 Grave Before Shave Beard Shampoo is serious stuff that’s well researched, well-formulated, easy to use and produces top quality results. This is a cleaner and conditioner combo that works its magic in subtle and mysterious ways and doesn’t require more than a drop or two to do just that. No one is going to mistake this for an all-natural product but there’s nothing here that’s going to cause irritation for most men. No formaldehyde, no lanolin and at the same time plenty of rejuvenating oils including Olea Europaea Fruit Oil and organic Argan Oil. This is an affordable and effective product with a very faint citrus scent that’s never intrusive. The conditioner here is more than an afterthought and leaves your beard feeling soft yet firm. Bluebeards has developed a reputation among the bearded as a beard wash with a difference. The difference being that it treats both your beard and the skin your beard springs from and depends on and it does so without leaving behind any nasty residue. There’s no sticky film on your skin the way there is with some low quality beard soaps and it won’t dry out your skin the way some other shampoos can. Bluebeards Original Beard Wash contains aloe for your skin along with an array of conditioning agents for your beard that leave it with the new beard feeling every time. If your beard is a victim of the frizzies Bluebeard’s got you covered as its combination of gentle cleaners and sophisticated conditioners infuse your beard with nourishing moisture. As is the case with other beard shampoos Bluebeards has a mild citrus scent that provides a clean, light air in the hours after shampooing. Spartans Den is an effective and easy to use shampoo that leaves your beard feeling fresh and clean while addressing the causes of dry skin that often accompanies facial hair. This is a premium beard wash that is produced in limited quantities to ensure overall quality. Its combination of shea, coconut and aloe vera soothe underlying skin, leaving it moist and eliminating itchiness and flaking. Spartans Den is formulated from an array of non-irritating ingredients and includes Medium Chain Triglycerides that provide a host of benefits for maintaining healthy skin. Unlike many other beard washes and shampoos Spartans Den make much of their scent, which has musky overtones but won’t leave you smelling like you bathed in patchouli oil. Wild Willies Beard Wash is an all-natural shampoo that penetrates to the heart of even the thickest beard and cleans right down to the follicles. The beard wash contains a potent mixture of essential oils along with vitamin E, lauryl betaine and aloe vera for your skin. Wild Willies Beard Wash requires only a small amount to be effective and doesn’t contain any harsh chemicals that can cause long term issues. The shampoo comes with a separate conditioner that should be applied immediately after shampooing and that will leave your beard with a full, fresh feeling that will last all day. Nothing revolutionary here. Just a well-made beard shampoo that doesn’t ignore your skin, doesn’t cost a bundle and is made the USA. Billy Jealousy Beard Wash is an all-natural beard wash that utilizes soy protein, aloe, honey and green tea extract to cleanse your beard of impurities and leave it feeling naturally soft and supple. It also has the agreeable habit of leaving the underlying skin moist and smooth, not red and raw like some discount beard washes can. Billy Jealousy is known for being sulfate free which is a big reason it’s so easy on your skin, while the honey and green tea extract banish frizziness and unmanageability. Billy Jealousy is an Esquire and Askmen.com award winner, is verifiably vegan and completely cruelty free. It’s also made in the USA. Q: Should I use Regular Shampoo or Beard Shampoo? A: Because the hair that grows on your face is typically of a more robust quality than that which grows on your head it’s imperative that you treat it as such. In addition, the skin on your face is likely not used to playing host to a beard which means that with some guys that skin will become dry and flaky if they don’t care for it properly. The most effective way to counteract dry, flaky facial skin is buying a beard wash or beard shampoo that contains effective moisturizers. Something standard shampoos don’t typically include. 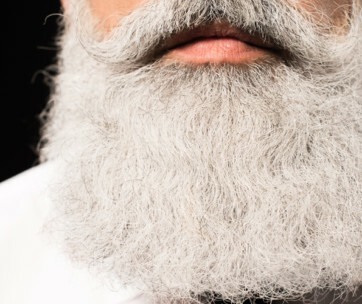 Facial hair is also prone to split ends for reasons no one is quite sure about. As a result, the texture of the beard can feel even coarser than it already is. Most top of the line beard shampoos will address this issue. Finally, standard hair shampoo almost always contains harsh detergents that don’t bother the thick, tough skin on top of your head but which can strip the thinner, more sensitive skin on your face of much needed moisture. Standard shampoos also tend to employ synthetic fragrances that you really don’t want to have wafting up from your beard into your nose all day long. Q: What Type of Ingredients Will You Find in Beard Shampoos and Washes? A: The ingredients used in the best beard shampoos are aimed at softening the coarse nature of your facial hair while respecting the underlying skin and preventing it from drying out or otherwise having an adverse reaction to your new hirsute profile. The quality of ingredients varies widely but, as with most things, the cheaper brands use the cheaper ingredients. The result is often beard dandruff, itching, flaking and widespread irritation of the underlying skin on the face and neck. Thus, if you see any of the following ingredients listed on a beard shampoo you’ll want to give it a pass. Propylene Glycol is better known to most people as antifreeze. Believe it or not the same chemical compound that keeps your engine from freezing is also used in some cheap beard shampoos. Q: What is the Right Way to Apply Beard Wash or Shampoo? A: This type of product will work best if you use it while taking a nice hot shower. Let the steam in the shower open up your pores for a while before rubbing a dollop of shampoo between your hands to generate a lather. Once you have a decent lather going work it into your beard thoroughly. This is crucial, especially if you have a long thick beard. Take all the time you need to make sure you work the shampoo right down to skin and then into the skin itself so the essential oils, aloe and other ingredients can do their job. Once you’re sure you’ve worked the shampoo in completely and you’ve taken an extra minute to massage it into the skin under the beard, let it sit and soak in for anywhere from 2 to 3 minutes. Rinse thoroughly. There’s typically no need to repeat. Once should be enough. Pat dry your beard when you get out of the shower and avoid using a hair dryer as that could really do a number on the skin under your beard. You won’t be shampooing your beard every day so on those non-shampoo days make sure you brush it out and use a high-quality beard oil to keep it looking and feeling fresh. Q: How Often Should I Wash my Beard? A: How often you wash your beard will depend on your skin type as well as the character of your beard. If you have oily skin you’ll want to wash your beard every other day, minimum. On the other hand, if your skin is dry don’t overdo it with the shampooing. Every 3 days should do the trick. Same with combination skin. If your beard is comprised of thick coarse hair don’t wait more than 3 days to wash it, regardless of your skin type. On the other hand, if your beard is somewhat thin you might get away with washing it every day if your skin can handle it. If you have a thin beard and dry skin try washing every other day and see how your skin reacts. If it’s too much go back every 3 days. You might also want to consider keeping your beard closely cropped in such situations.